NEW 8-SUSPECT VERSION OF THIS MYSTERY NOW AVAILABLE! It was the match of the century for the prestigious Porous Pines Country Club. For the past decade, professional champion Holin Wunn had dominated the tournaments throughout the region. His prowess as a pro resulted in awards, accolades and, of course, a lifestyle that most golfers only dream of. Wunn's tenacity on the tee and rigor in the rough were unchallenged by any man - but not so when it came to women. For the past year, Birdie Bigalow, the undisputed women's regional champ had repeatedly issued a challenge to the legendary Wunn. She would (so she proclaimed) in match play, demonstrate that Wunn's stance to keep women out of men's tournaments was more the result of fear than fact. "Golf is more brains than brawn," she told the press. "He might drive the ball farther, but no one can size up a course like I can." With pressure from all sides, Wunn finally agreed to the head-to-head confrontation. The date of the match was set. Reporters gushed over a legendary battle of the sexes to settle the matter once and for all. It would be 18 holes of golf that would go down in the annals of the game. After 17 holes, Wunn was 1-up. That's when it became dead-even. For as Wunn teed up for the 18th hole, a deathly silence fell over the crowd. 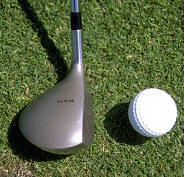 Just as his driver reached the zenith of its arc, Wunn released the club. His eyes rolled back in their sockets and he collapsed. All efforts to revive him failed. At first, observers feared a hidden medical problem had surfaced, yet police thought otherwise. They confirmed that the evidence pointed toward homicide. Who would dare club to death the gender controversy with such irony? Why would they even putter around with such matters? Now, it would be necessary to trap a killer with a stroke of investigative genius. Surely the rumors couldn't be true. Wunn wouldn't ditch Klubs in favor of a younger caddie, would he? She told everyone that Birdie would win this event. What did she really have riding on the match? For the past five years, the world-famous Sadasi "Sheesh" has been a fixture on all of Wunn's golf gear. What would have happened when Wunn's endorsement contract expires next week? Wunn and Sandy don't get along. Is she as vindictive as some of the members say? Wunn constantly complained about the condition of the course. How could he develop a stellar reputation if Wunn kept saying rotten things about his ability? Toten Klubs's cousin hasn't latched onto a big paycheck yet. How would he do that? Nemo's brother and rival used to be his business partner. What would he be doing at Porous Pines? Who murdered golf champion Holin Wunn? I have to compliment you on how easy you made it for me. I had never gone to one or given one but, once I read through the materials and instructions it was really easy. I have used other mystery writers before but nothing comes close to the TOTAL package that is presented by you...my guests loved it!! I decided to do something really unique and hold a murder mystery party. It was a complete success and everyone had a great time. Thanks again for such a wonderful evening's entertainment. I work at an Assisted Living Facility, and our residents had a TERRIFIC time watching the staff put on the mystery for them! We look forward to future business with you! You are truly talented!